Johnsonville today launches its biggest campaign related to National Bratwurst Day with a 12-day, sausage-themed Facebook effort dubbed "12 Days of Bratsgiving." Leading up to National Bratwurst Day on Aug. 16, the marketer (with the help of agency Cramer-Krasselt) will post a question to its Facebook page each day with a sausage tie-in. For example, one question asks fans to submit a family picture. Johnsonville will then commission a watercolor artist to paint a portrait based on the picture that is, of course, decorated with bratwursts for one lucky family. Other examples of prizes include knitted koozies, wreaths and baby bibs. 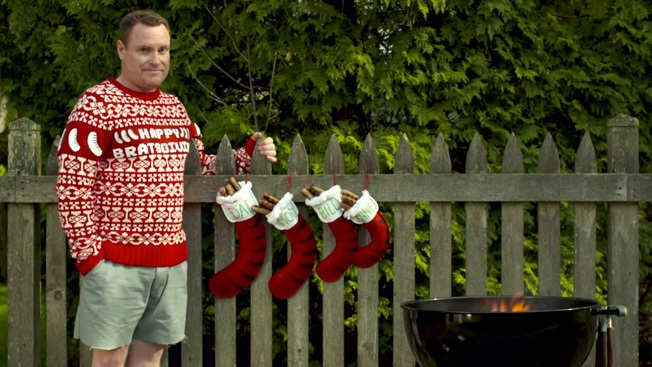 The campaign centers around a new two-minute video featuring Johnsonville’s online-only Brattender character. This is the third year that the sausage maker has employed Brattender in its summer marketing, but it’s the first time that he is used to build excitement around the upcoming holiday. "We’ve not celebrated National Bratwurst Day to this level before, so we really thought our character—the Brattender—would be the ideal person to help get in the spirit," said Stephanie Dlugopolski, Johnsonville’s PR and social media manager. Johnsonville is betting on a Facebook event that lets users RSVP to what it has loosely coined Bratsgiving Day to help spread the word, and it is also buying Facebook promos to show up in more newsfeeds. Promoted Tweets on Twitter and YouTube ads are also part of a paid media plan. According to Jamie Schmelzer, vp/management supervisor at Cramer-Krasselt, Facebook became the focus because of its reach. "Facebook has always been the anchor of this thing just because, with our community and within social, it’s the one that gives us scale," Schmelzer explained. "Plus, this has been primarily a video platform, and while obviously we’ve used YouTube, Facebook has taken on such increased importance right now in video." To Schmelzer’s point, Johnsonville has more than 343,000 Facebook "Likes" compared to 21,000 Twitter and 7,900 Pinterest followers. Check out the new Johnsonville video below.